Brief Physical Description: Gigi is on the smaller and shorter side, her puffy jacket making her look even smaller! She has an asymmetrical light-brown haircut, the shorter side swept up into spikes and the longer side flipping up at her shoulders. 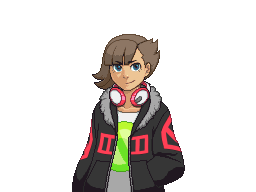 She's always seen wearing her puffy black-with-red-graphic jacket, her red/white wireless headphones, and never leaves the house without a portable console of some sort. Brief Personality Description: Somewhat of a jokester, but bratty when things aren't going her way. She appears friendly and approachable but will immediately pull out a gaming device or smart phone or mp3 or a bag of chips (where does she keep everything??) if she's not interested in what you have to say. VERY competitive as well! 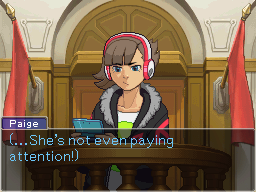 Connection to canon characters (if applicable): Involved in a case that Apollo Justice might take. Apollo reminds her of a video game boss she hates (and ends up bugging him constantly because of this resemblance). Brief Background: Gigi's always been a big gamer. Playing competitively for hours and hours after school and pitting herself against the video game club, she honed her skills and broke into the pro gaming world. She became somewhat of an icon, but her bratty attitude lost her some opportunities (and gained her some enemies). After throwing a fit when she was disqualified from a big tournament, she pursued something that she felt would give her more power: hacking. This didn't help her when her pro rival was killed during a tournament she attended months later. While she started as a witness to the event, when pressed to find out she had been involved in unsavory things in the hacking underground, it became much easier to paint her as the murderer. Notes: Sorry, I had to type this up very quickly! Her name is Gigi (GG!) Conred (Code Red). Sprites made from scratch, referenced Trucy's neutral sprite for general style.